Home / Atlantis / BBC / Mythology / Reviews / TV / [Review] - Atlantis, Series 1 Episode 1, "The Earth Bull"
[Review] - Atlantis, Series 1 Episode 1, "The Earth Bull"
Atlantis is the BBC's attempt to fill the void left in the schedule by the culmination of Merlin. The edict is simple: a rousing adventure series fit for the whole family, with plenty of opportunity for CGI creatures and slow motion fight scenes. And, in that they have succeeded. Atlantis, in it's first episode, is a worthy successor to the Merlin timeslot. Right off the bat, it displays more of the level of maturity that it took Merlin five series to grow into, with the characters more confident in themselves while still leaving room for growth, and a tone more than willing to tread closer to darkness. That being said, comparisons to Merlin should stop now, and they shall. Atlantis is something else entirely, not just a reframing of the classical myths, but a complete reinvention. As someone who has studied the Classics long, the changes were at times jarring, but no less interesting. After 4000 years, these stories have earned the right to a little artistic interpretation. Starting next week, these reviews will move to Tuesdays, now that Breaking Bad has vacated that position. Hit the jump for the review, which contains spoilers that have obviously heard of Hercules. I was not expecting time travel, I'll say that much straight away. It was an interesting choice, and one I'm sure will be explored in greater detail as the mystery of Jason's father is explored over the course of the series. But talk about throwing the viewer off from the get-go. If nothing else prepares the audience for the up-ending of the traditional myths that this show is ready to unleash, it's that the entire premise is set up with Jason (not of the Argonauts) getting sucked through a wormhole (named The Gateway by a cagey Oracle) in a submarine and deposited on the beaches of a Cretan Atlantis. I buy that premise, I have no issue following it. Where the whole thing fell over, in my opinion, was with the speed and near apathy by which Jason accepts his situation. There is unexpected discomfort at first, by by the time he visits the Oracle, he is well prepared to just live in this world. And aside from a recognition of Pythagoras (who is about 500 years older than his real life counterpart), there is no attempted applications of modern world technologies or knowledge to benefit him. Considering that the myth of the Minotaur is one of the best known in the Western world, you'd think a flicker of recognition would flutter about Jason's mind. Perhaps this will be explored in later episodes. Or, perhaps we're dealing with some alternative reality stuff that will explain it. Or maybe it was just something that didn't occur to the writers. Either way, by brushing past the "acclimation" phase of Jason's journey into the past, they were able to get right to the thick of the plot. And there lies the second issue I had with the episode: it moved very quickly. King Minos, the Minotaur, Ariadne, and the repression of the Atlantian people are all introduced with as little lingering as possible. Jason is no sooner settled in, then he is sacrificing himself to save his newly acquired friends (we'll get to them in a moment). In fact, besides saving Pythagoras, there isn't a reason for Jason to be involved in this immediate story. My preference would have been for the series to establish itself, and the characters, before jumping into what represents for the city a major political turn over. There is no long a blind culling of the populace, Jason would be revered as a hero (or condemned as a terrorist), and a constant looming threat no longer exists. It would have been nice to know more about the city, and to give Jason a greater purpose for killing the Minotaur than just saving a friend (though, that purpose is no less noble). One has to wonder though, if people were being sacrificed to appease an angry Poseidon (who the residents of Atlantis less worship and more fear), then the Minotaur's death would be less a freedom from slavery and more a rebellious act that must be punished. For it's failings as an introductory episode, it was an enjoyable hour of television. The special effects are at a level we've come to expect from Saturday adventures on the BBC, the acting falling into the same. Relative newcomer Jack Donnelly is fine as Jason, though not spectacular, not yet. Truth is, no one is given much to be spectacular with. No one was overly annoying, but since we're still in the establishment phase of the relationship, there wasn't much of a chance to dig very deep. The exception is Sarah Parish as Pasiphaë, who despite very few lines, exudes a Lady Macbeth vibe that is hard to ignore. Power behind the throne is an easy theme to explore, but considering that Alexander Siddig's Minos is traditionally a blood thirsty tyrant, and here appears to be little more than an empty shirt, or easily manipulated puppet, it is a stark change. 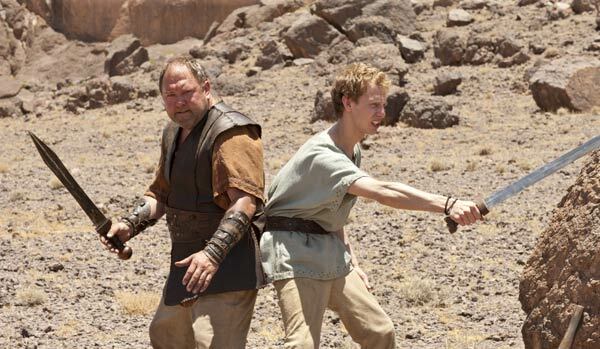 The stand out in the cast, however, is Mark Addy as Hercules. His role isn't any more developed than anyone else in these early days, but Addy is the best actor of the bunch, and does more with the little he is given. He immediately makes Hercules a likable, if arrogant, character, and will no doubt be the anchor of the series. The Earth Bull referred to in the title is the Minotaur traditionally of the Theseus myth, and as I mentioned while the series was being teased, the series uses the Theseus myth for a lot of it's foundation. this first episode is essentially just that, with Jason standing in. Atlantis is heavily Cretan, Minos and his family are the rulers, the Minotaur is fed citizens to appease an angry god, and Hercules becomes friends with the man who kills Minos' shame. Where does it deviate from the legend? Well, pretty much everywhere. The Minotaur, rather than being the monster offspring of Pasiphaë and Minos' prize bull (try explaining that to a tea-time audience), he was a man cursed by the gods (who, it should be noted, despite clearly having an influence over the world, like changing a man into a bull-monster, are absent from the procedures). He also has a connection to Jason's unnamed father, who went missing an indeterminate time ago from the modern world, and who it appears was from Atlantis originally (as was Jason). The mystery of who Jason's father, and Jason himself, really is, will no doubt be the central mystery of the series, and if traditional myths are any indication, it'll probably be Zeus or Poseidon. However, tradition isn't something we can take comfort in with this series. It presents a unique and interesting version of a well told world, and I'm very much looking forward to seeing where the writers take the story. Will apparently all of mythology available to them, to plunder as they like, the potential for really interesting stories exists side by side with the potential for the series to self destruct under its own hubris. This episode had both in equal measure, and moving forwards I'd like to see more attention paid to pacing, with less attention to plot-of-the-week and more attention to world building. And, as is the ultimate trick with any myth-inspired story, the writers must choose whether the gods are physical elements within the world, or if they are boogie-men. You can't have it both ways, and if there are beings that are able to turn men into stockyard animals, then they will eventually need to play a direct role on the show. Better to pick a side now, and stick with it, rather than be inconsistent as the plot demands.